This fantastic recipe is quick and easy to prepare and is a great mid week treat. 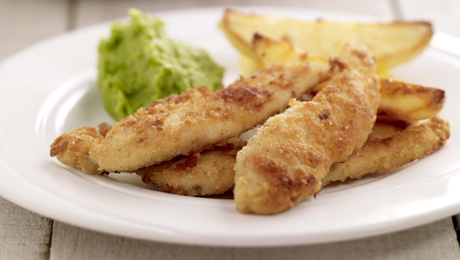 Cut each piece of chicken into 4 or 5 long thin strips and place in a small bowl with the plain flour. In a separate bowl whisk together the egg and half the breadcrumbs and in a third bowl mix together the remaining breadcrumbs and the grated cheese. Completely coat the chicken in the plain flour, shaking off the excess and then transfer the flour coated chicken into the egg mixture, ensuring it is fully coated before transferring it to the cheesy breadcrumb mixture. Coat each chicken strip in the breadcrumb mixture, ensuring that it is fully coated. Heat a large frying pan with a couple of tablespoons of oil and pan fry the chicken strips for approximately 2 minutes on each side until they are golden brown. Transfer to a baking tray and continue cooking for 10-12 minutes to ensure that the chicken is fully cooked. In a medium sized saucepan, sauté the diced onion and garlic in a little oil for 2-3 minutes until softened. Then add in the frozen peas and continue to cook for 2-3 minutes as the peas begin to defrost. Next add the milk, cover with a tightly fitting lid, reduce the heat to a gentle simmer and continue to cook for 4-5 minutes. Transfer the entire mixture to a food processor and blitz until completely smooth. Cut the potatoes into thick strips and place in a large mixing bowl. Drizzle with a tablespoon of oil, season with salt and pepper and mix well. Place on a flat baking tray lined with baking parchment and transfer to the preheated oven and bake for 25-30 minutes until crispy on the outside and softened through to the centre. Hi Dawn, apologies for the confusion. use up to half of the breadcrumbs in the egg and the rest with the cheese. So, do I use the breadcrumbs with the egg, or the breadcrumbs with the cheese? Or do I use half with each?